So dear friends, end of this small journey of my life in Korea certainly needs a celebration and i would like to invite you all for a cool drink :) Enjoy this cool refreshing drink this summer. Rumana...Both the drinks lokks refreshing and super clicks da..
Good luck with setting up new house and hurray for shopping!!!!!! Happy Journey. Good Luck with everything. Have fun shopping back in India. Enjoy! The drink looks splendid! Take care. rumana really enjoyed reading the moving story.Happy Journey and enjoy. really miss ur post.Don't worry about setting up the new home..sure u can do it as fast as u wish. what a delicious refreshing drinks..i like the tulsi seeds..the best drink i love is falooda. Have a wonderful and safe trip back to India. I know it is bitter sweet, but I am sure you will have fun. Lovely drinks. I will miss your posts for 2 weeks. Hope you can come back online ASAP. Wishing you a safe journey to India.Drinks look delicious and refreshing. Have a wonderful and safe journey Rumana, Both drinks looks catchy and refreshing..
Congrats on setting up your new home, it's pretty exciting right...Love both of the drink, very beautiful color indeed.. Refreshing drinks...perfect for the weather ! Have a safe trip back to home.Enjoy your time with your family,take time settling down and enjoy shopping around.Will wait for your wonderful recipes.Very refreshing cool drinks,enjoyed having them with you. Hope u enjoy the trip and setting up ur new house dear. All the best. the two drinks look very refreshing and tasty. Rumana,, Happy flight n enjoy ur new place dear sure u will manage to setup the households women can handle dear.Both the drinks looks perfect n colourful dear. Happy journey dear. Welcome back to Incredible India...! The drinks are awesome and colorful...! Refreshing drinks...perfect for the weather !Happy journey dear. Welcome back to Incredible India...! Have a safe trip, happy journey. I know its stressful...but to enjoy shopping and setting up your new home:) This is a perfect summer drink, I fix it once in a while to beat the heat, basil seeds are very cooling. Both drinks look really refreshing! Have a safe journey! You must be so excited to go back home. All the very best to you! Rumana, thanks for visiting my website and for your comment. You have a great blog too, love all your recipe and a great presentation. 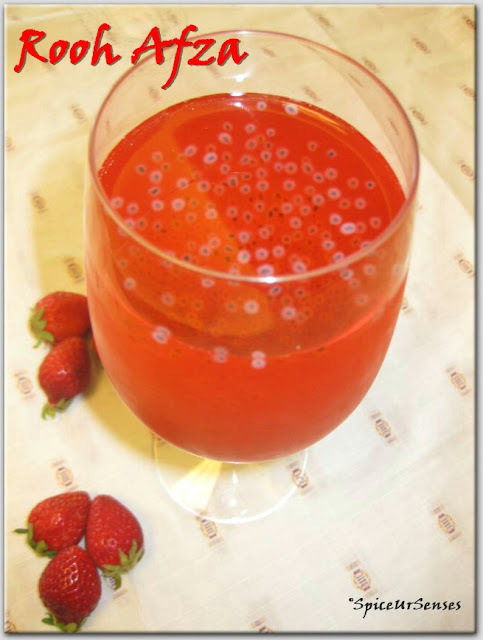 Rooh Afza is a great drink for summer to beat the heat, love it with Tulsi seeds. Looking forward to sharing recipe with you. Wish you a happy journey and happy setting up... We are moving too in the coming months so I know what you mean... my husband has put a stop to my shopping as well... goodluck and have fun! Lovely drinks, Rumana..Happy journey and enjoy setting up your new home :) All the best!! roohafza..my hubby's fav...that looks so refreshing...beautiful pics...hv a safe journey back home...tk care...enjoy. Happy Journey dear...All the best with your new house decorations ;)..i know how excited you ll be.. Happy & Safe journey. Wish you all the best for your new home. Hope to see you soon. Both drinks looks cool and refreshing. Have a safety trip. Congratulations on your new environment. Until your next blog. I really Wish you all the best for your new home. Hope to see you soon. thanx for the info. I just love Rooh Afza with Tulsi Seeds. It Roxx. Great pakistani drink. Thnaks for the share. Wow, Korean milk shake I love this. Thank you for the recipe post. Well, Enjoy your time with your family,take time settling down and enjoy shopping around. thanx for the share. 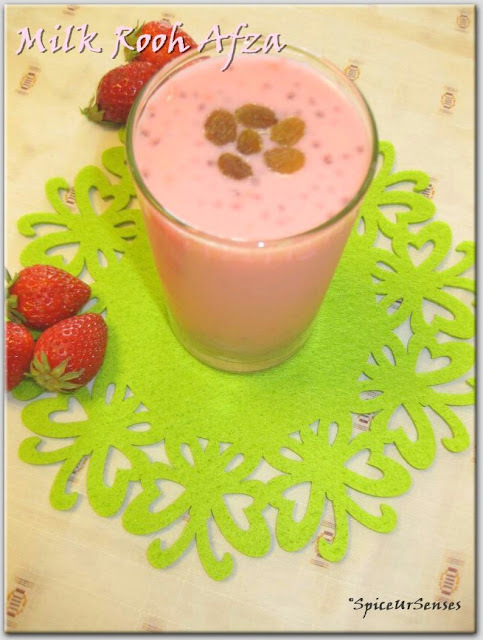 I will wait for your wonderful recipes.Very refreshing cool drinks, enjoyed having them with you. anyway thanx for posting. I am so happy to the both of you and your hubby..I hope you will have a bless life living in Korea..I enjoyed your post. Thanks for the share. Nice so delicious, How much is Rooh afza bottle in India? I just love Rooh Afza. Its great pakistani dish. Nice sharing!! I will miss your posts for 2 weeks. Hope you can come back online ASAP, any way thanx for the share. Wow, really refreshing! Have a safe journey! You must be so excited to go back home. All the very best to you, thanx for the post. You have a great blog too, love all your recipe and a great presentation.